So I did not have the picture of my friend Tony Attaway to post on my last blog post, but I found this one that my stepdad Brian took and it kind of shows what I want you to see. Tony tells me he does not take it well when someone says nice things about him. He also said that he does not think he did so many good things when he was my age. I don’t believe you Tony! Tony is my friend from the Emmanuel Dining Room. He works for the Ministry of Caring. He is there every weekend when I deliver bags. He says I am his little hero and I want him to know he is also a hero of mine. He makes it his job to feed people who are hungry. But he does not just feed them food. He talks to every single person who comes to eat at the soup kitchen. He helps then find a table to sit. He knows their names. I am trying very hard to make sure that when I give out my 3B bags that I also talk to who receives them. That I tell them I hope they have a good day. That I learn their names! I know it was not what you wanted to be surprised by me at my 3B Summer Celebration. But I am so happy you came and I am so happy I could give you an award. You deserve it! P.S. When I get the photos from Danielle Quigley (our beautiful photographer friend) I will send on to Ms. Dorine so she can give it to you. Catrina Sharp from Gals That Give she challenged me to do the ALS Ice Bucket Challenge! I nominated my Mom, my Uncle Greg and my buddy Senator Bryan Townsend! It has been a couple of weeks since I last updated everyone. Really there is so much to talk about! Since my last post I’ve been keeping busy. My Gram, Mom, Finn and Amelia went with me to the Blue Ball Barn in Wilmington for the Cabot Community Tour event. It was fun and I had a chance to see Delaware’s First Lady Carla Markell again. The Fun Department was there, too, from WSTW and they were playing music and had games and stuff. It was a fun event. Then on Friday June 20th I went to Dover with my Mom. This time I spoke to a group just outside of Legislative Hall and it was the IM40 4-H group who had come to Legislative Hall for a field trip. It was a small group of kids but they asked good questions and it was kind of nice to talk to kids and try and encourage them to help out around their community. Plus Ms. Kyle Jones from WMDT ABC 47 came to interview me and she took some video of me talking to the group and then it was on ABC 47 in Salisbury, Maryland. She was really nice and so were the kids. And the leader’s name was Ms. Sequoia Rent and she gave me a cool IM40 shirt and she said she was very proud of me. 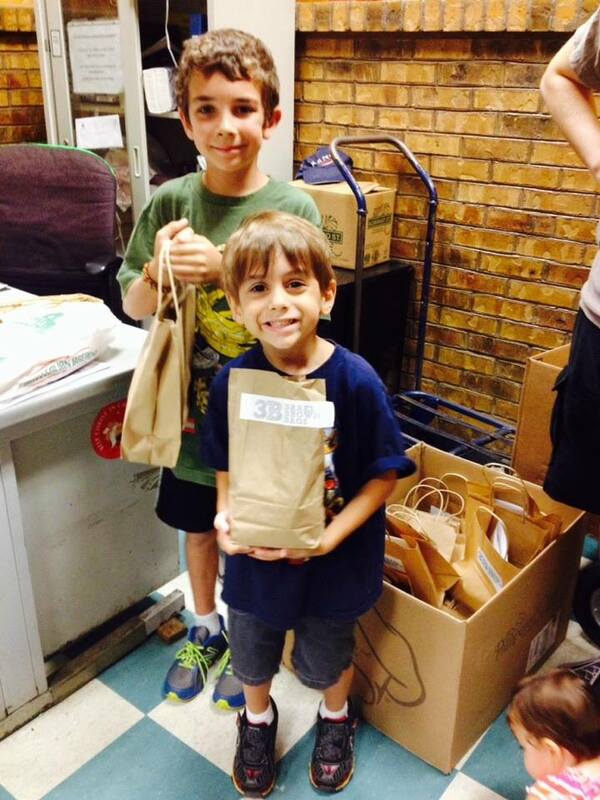 And then on Sunday, June 22nd I delivered 60 bags to the Emmanuel Dining Room. They were all work force bags so they had additional toiletry items in them. Many thanks to the girl scouts who gave me many of those donations. Then on Wednesday, June 25th bright and early in the morning my Mom took me to Wilmington and I was able to meet a bunch of the staff from the Ministry of Caring. I talked with them at their staff meeting. 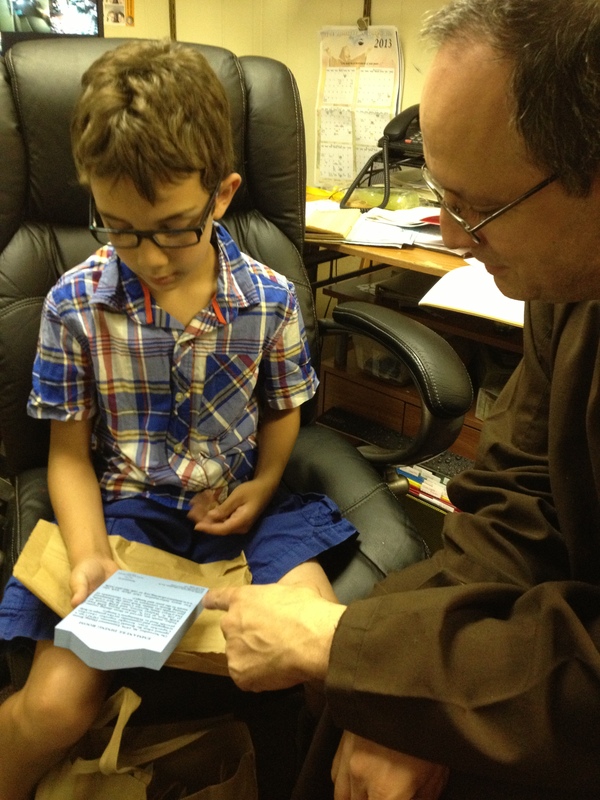 I told them about what I have been doing with Brae’s Brown Bags and I also told them about why it is important. The person who introduced me, his name is Mark, he was so nice. He said really nice things about me and it made me feel important. He even said that when I’m old enough to have a job that there are a bunch of things he would like to hire me to do. Include being a lobbyist which I had to ask my Mom what that meant. And when he introduced me he was talking about how there are hundreds of abbreviations that people know all over the world because they are a symbol of something important and of something that makes a difference. He said like MLK and JFK, like NASA and SOS. He said the newest important abbreviation, one that people all over will know and it will mean something to them will be 3B. I am not sure that I could have smiled bigger or felt more happy than I did when he said those things. At the same time I could not believe he was talking about me and 3B. So thank you. Thank you to everyone who helps me with Brae’s Brown Bags and please know that you are also helping everyone who gets one of the 3B bags. We are all making a difference, one bag at a time. My Mom and I have been sending out invitations to my 3B Summer Celebration. It’s going to be a super fun family event held at the YMCA in Bear and it is for everyone who has helped Brae’s Brown Bags grow. So be on the look out for your invite. Oh and my stepdad and my Mom and my brother, we all went to see a concert last night. We saw American Authors, The Script and OneRepublic and it was AWESOME! So awesome! I knew a lot of the songs. I am hoping to get them so I can listen to them now at home, too. Big BIG things are coming up and I can’t wait to tell all of you but it has to wait a little bit. So check back here in the next week or so to find out what amazing opportunity I have been given for July! Using some of the bags I packed with the University of Delaware Food Science Club, my family and I went to the Emmanuel Dining Room (EDR) yesterday and handed out 85 Brae’s Brown Bags to the people who visited. A lot of people said thank you for the bags. The best part was when a lady took one of the bags, left EDR and then came back. First she went up to my Mom and my Step Dad to say thank you but they told her that the bags were my project and so she came over to me at the table I was standing at to hand out bags. She tapped me on my shoulder and she said she almost cried when she read the insert that I put in all the bags. She must have thanked me 12 times for the bag I gave her and I really felt so happy that she liked it that much. I’m not sure when we will be going back to EDR but I hope we can soon! Thank you to everyone there for your help and for letting us hand out the 3B bags. Yesterday, I met Brother Miguel at the Emmanuel Dining Room. He told me the building use to be a fire hall. The place where people sit to eat now use to have two fire trucks. Brother Ronald found the building once it was emptied and he asked the city if he could buy it and use it to provide a safe place and food for those who are hungry. On the top floor of the building women and children have a place they can stay and it is called Hope House. Brother Miguel met with my Mom and me in the basement. We talked about Brae’s Brown Bags and I gave him four bags. He really likes my idea. He gave me a wooden plaque that looks like the Emmanuel Dining Room building it was a very nice gift. It has stuff written on the back about their mission. I have it in the family room in my house now. 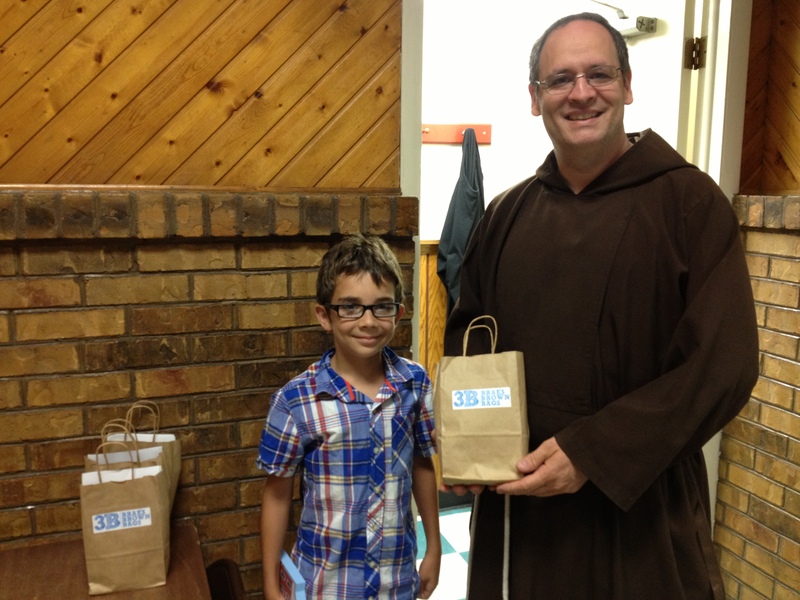 Brother Miguel says I can hand out Brae’s Brown Bags at the Emmanuel Dining Room using their giveaway table. After someone eats a hot meal for lunch they can then take a Brae’s Brown Bag which will have a drink and snacks for them for the rest of the day. He invited me to come back on August 25th. I am going to make at least 50 bags to bring with me on that day. I will be able to hand them to people when they leave the dining room. So on Sunday, August 25th I will return to the Emmanuel Dining Room with a bunch of Brae’s Brown Bags and I’m very excited. Brother Miguel said if we can go once a month with bags that would be great. I hope we can, I know there are a lot of people out there I can help. A lot of people asked if they can help, too. You can. You can volunteer at the dining room or you can donate food. If you want to help with 3B we could always use more bags and fillers. I like to use healthy snacks and water bottles. Thank you everyone for all the nice things you said on my Mom’s facebook page. That was pretty cool. My Mom and I were supposed to meet with people at the Ministry of Caring who work for the Emmanuel Dining Room. But my baby sister Amelia got sick and we had to reschedule. Thankfully the people were understanding and nice and they let us reschedule. We should be going there next week. I did a guest blog post on the Jr. Food Critic website and I just saw that it posted a week or so ago. I can’t believe I missed it. You can read the blog at jrfoodcritic.com. Oh also there are two more people who have handed out Brae’s Brown Bags. Plus my Mom and Brian handed out one the other day when they were taking my baby sister to the doctor. So now I think that is 10 that have been handed out all together. So my Mom told me that next week on Wednesday I will be meeting with people at the Emmanuel Dining Room which is one of the Ministry of Caring projects. I’m excited about this because it means Brae’s Brown Bags will maybe have more helpers and also will have the chance to be given to more people. So far I have given out 8 bags and I feel good about that. We always have a bag with us while we are driving around. There is a place near my house that often has a homeless person standing nearby but yesterday I saw a sign that says people aren’t allowed to loiter there anymore. I found out that means people must have complained about the people who would stand there. I don’t know if that will make a difference but it kind of makes me sad. So like I said, on Wednesday August 7th I will visit another place who is interested in helping with Brae’s Brown Bags and I think it will be a good thing.